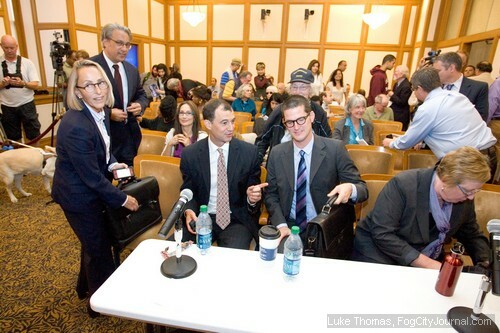 The San Francisco Ethics Commission voted 4-1 Thursday to sustain two of six charges of official misconduct filed by Mayor Ed Lee against suspended Sheriff Ross Mirkarimi. Photos by Luke Thomas. The San Francisco Ethics Commission Thursday sustained two of six charges of official misconduct lodged against suspended Sheriff Ross Mirkarimi by Mayor Ed Lee, a decision reached after the quasi-judicial body struggled to interpret and apply an untested definition of official misconduct as defined in the City Charter. 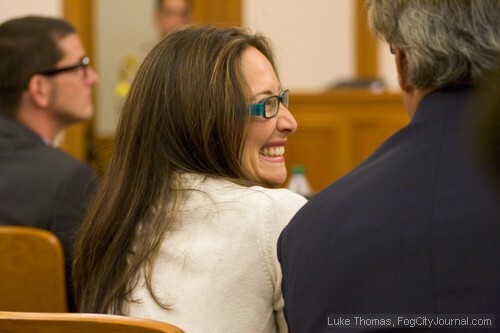 In its 4-1 decision, with Chair Ben Hur in dissent, the commission rejected as not credible star witness testimony of Mirkarimi’s wife, Eliana Lopez, who testified under oath her husband did not abuse her on December 31 when, during a heated argument, Mirkarimi grabbed Lopez’s arm and caused a bruise. Instead, the commission relied on a video of a tearful Lopez, recorded January 1 by the couple’s neighbor, Ivory Madison, who urged Lopez to make the video, which, Madison said, could be used against Mirkarimi in the event the couple sought divorce, or entered into a child custody battle. Madison, without consulting Lopez or seeking her permission, reported the incident January 4 to police, triggering a criminal investigation and a cascade of administrative and legal hardships imposed on the family including the mayor’s suspension of Mirkarimi without pay and the couple’s forced separation. Citing “insufficient evidence,” the commission unanimously rejected the mayor’s amended charges of witness dissuasion and impeding a police investigation (count 3), abuse of office (count 2), or that Mirkarimi committed domestic violence (count 1). Instead, the commission said Mirkarimi’s action on December 31 that led to his plea and conviction of misdemeanor false imprisonment (count 4), was in effect a breach of conduct code required of a Sheriff-Elect (count 5). Count 6, also rejected, contained the same charge as count 5 but was applied to the office of supervisor, the position Mirkarimi held until he was sworn in as Sheriff on January 8. By sustaining at least one of the mayor’s charges, the commission is implicitly recommending to the Board of Supervisors that the sheriff should be removed from office, said Scott Emblidge, legal counsel representing the commission and the Board of Supervisors. “If not so sustained, then the suspended officer shall be reinstated,” Emblidge added. The quasi-judicial body comprises five political appointees – three of whom were appointed by the elected heads of the departments directly involved in the criminal and administrative prosecution of Mirkarimi, raising questions as to whether the appointees could adjudicate the matter without some measure of partiality. 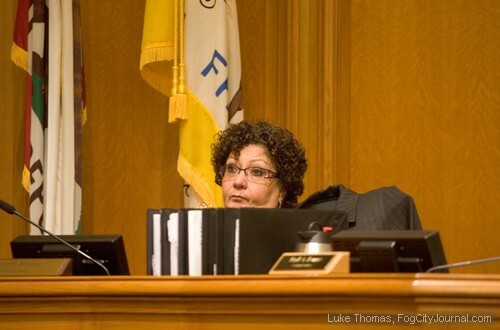 Mirkarimi and Lopez have maintained from the outset that the zealous nature of Mirkarimi’s prosecution is politically motivated, a belief bolstered by the mayor’s alleged perjury on the witness stand. The definition of official misconduct as defined in the SF City Charter. That partiality was tested over the sometimes dizzying interpretations of the definition of official misconduct with Commissioners Paul Renne (appointed by District Attorney George Gascón), Beverly Hayon (appointed by Mayor Lee), Dorothy Liu (appointed by the Board of Supervisors) and Jamienne Studley (appointed by City Attorney Dennis Herrera) stating that the requirement test of “wrongful behavior by a public officer” in relationship “to the duties of his or her office” is met because the Sheriff oversees domestic violence programs. 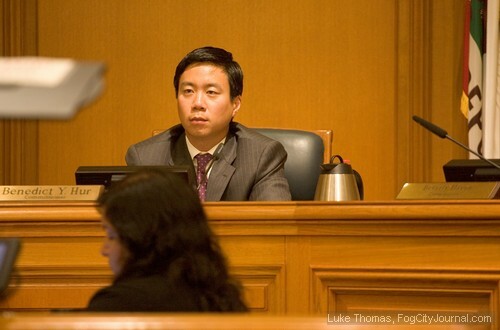 Hur, who was appointed by Assessor Phil Ting, said, in his view, there had to be a direct relationship between the wrongful behavior and the office held, basing his interpretation on a legal precedent set in the 1980 appellate case of Joseph P. Mazzola vs. City and County of San Francisco, a decision resulting in the overturning of Mazzola’s suspension. Ethics Commission Chair Ben Hur. Hur also raised the question of whether official misconduct or removal from office is applicable to Mirkarimi since he was not sworn into the office of sheriff until January 8. Renne then responded with a hypothetical question, asking Hur that if Mirkarimi was running for re-election to the Board of Supervisors, whether an act of domestic violence would apply to the question of whether Supervisor-Elect Mirkarimi would be guilty of official misconduct. “But that dicta was before this ordinance was ever passed,” Renne responded. “The ordinance had been passed and the language that is now in the ordinance that’s in relation to the duties language, is the same precise language that Mazzola addressed,” Hur said. After voting on the motion to sustain the reduced charges, the commission agreed to reconvene in the coming weeks to approve a written summary of its recommendation, which, together with a 15-inch stack of transcribed testimony, will be delivered to the Board of Supervisors for its considerations. If the Board fails to act on the recommendation within 30 days, a suspended officer is reinstated by default. 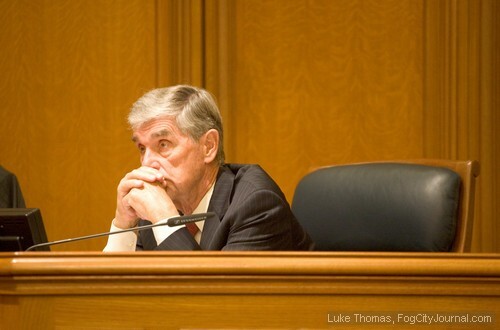 Nine of eleven supervisors must vote in the affirmative to remove an elected official from office. The Board could also vote to discipline Mirkarimi, rather than remove him from office, according to the Charter. Following the decision, the mayor released a statement. “I am pleased that the members of the Ethics Commission, following a careful review of the evidence, and in the face of a sustained campaign to distract and misdirect them from the facts, agreed with me that Ross Mirkarimi’s actions constitute official misconduct and fall below the ethical conduct we expect of the sheriff, our top law enforcement officer,” Lee said. 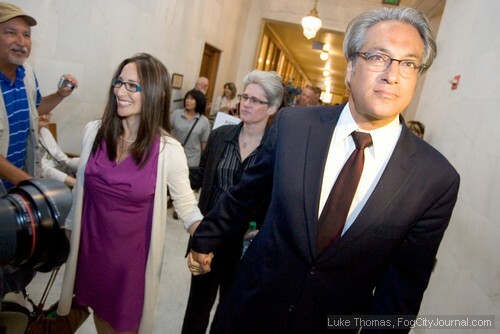 Suspended Sheriff Ross Mirkarimi and his wife, Eliana Lopez. Comments for A “Guinea Pig” in the “Twilight Zone”: Commission Sustains Reduced Charges Against Suspended Sheriff are now closed. Ann, wouldn’t surprise me if ‘downtown’ found a way to manipulate the law and count his suspension as ‘time served’. Phew… predictable result – and maybe for the best. Hopefully the BOS will take a pass and punt the ball back into the court of public opinion where it belongs. The “Recall Ross” folks are locked, loaded and ready for bear. Let chaos and confusion reign. Re “locked, loaded, and. . . “: I don’t believe they can attempt a recall until Ross has served six months, and he’s only served an actual month or so. At first I expected them to file in June, but then it occurred to me that the law says a recall can’t be mounted till he’s served six months and he hasn’t done that yet. And here’s an example of what’s at stake: In Contra Costa County, the sheriff wants to build a new jail to contain state prisoners sent back to their home county jails due to state budget cuts. The Richmond Police Chief opposes it. The County Board of Supes will, it seems, decide. Law enforcement executives are going to have a lot to do with whether counties respond to the return of state prisoners by building more jails, or with alternative sentencing and restorative justice, especially for nonviolent offenders. Excellent job — one of the best I’ve read. I give thanks that this family is reunited. The rest will sort itself out. Vivan los Mirkarimis. Que vivan!